Antibodies are custom designed to neutralize or disintegrate one specific type of antigen. White blood cells called B cell lymphocytes seek out and lock-on to antigenic proteins or sugars on the invader's surface. The B cell then uses that lock and key pattern to make antibodies tailored to that antigen only. It also will make clones of itself called plasma cells. Most of the clones begin producing antibodies for that antigen. Others become memory cells which may spend years wandering through the blood stream looking for that specific antigen. If the body is exposed to it again the memory cells lock-on to one and begin producing plasma cell clones and a flood of antibodies that wipe out the invader. One lymphocyte can divide into hundreds of plasma cells in a few days. A mature plasma cell can make about 2000 antibodies every second for the few days it lives. This is how the body acquires immunity. The body's ability to resist and recover from illness depends upon how rapidly it can produce massive amounts of antibodies to fend off the initial attack. 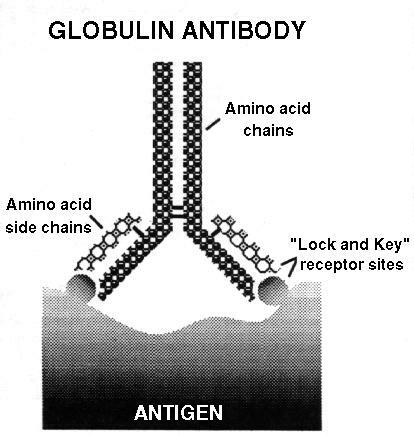 If the globulin protein starting material is in short supply the army of antibodies may be too small to prevent the symptoms of sickness from setting in. Hemp seed is the premier plant-seed provider of globulin starting material -- the highest in the plant kingdom. Eating hemp seeds will insure the immune system has the reservoir of immunoglobulin resources needed to make disease destroying antibodies.